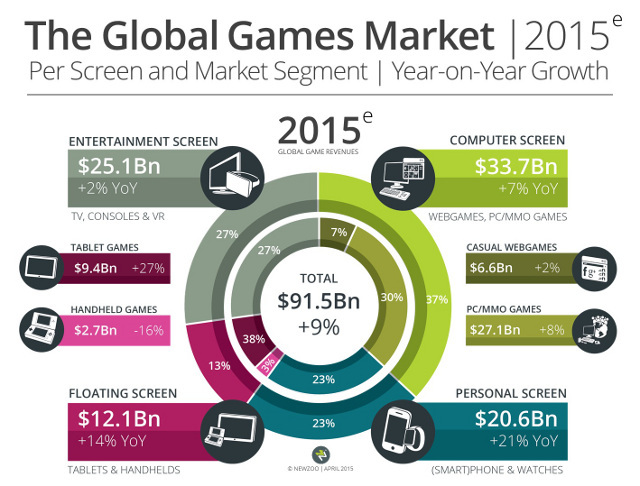 Newzoo has shared some info from their upcoming 2015 Global Games Report. 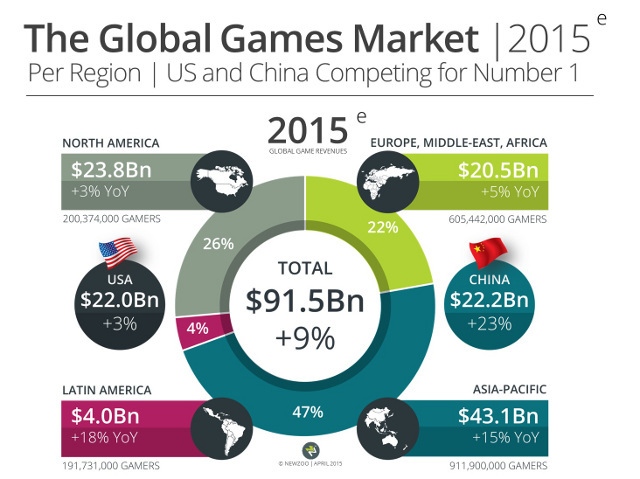 They forecast that the global games market will jump from €74.6 billion to €81.6 billion, that’s an impressive 9.4% increase. Their estimates also show that China could move ahead of the US and become the world’s largest games market by revenues in 2015. That is one year sooner than expected. As far as platforms are concerned, the Computer Screen (PC/Mac) is by far the most popular choice for gaming. It takes 37% of the pie. The Entertainment Screen (TV/Console, VR) has a healthy share of 27%. The use of handheld consoles is declining by a steep 16%, with a clear shift towards gaming on tablets (+27%). As handheld consoles and tablets make up the Floating Screen segment together, this still results in a 14% growth. The fastest growing segment is the Personal Screen (Smartphones, Smartwatches), with a year-on-year growth of 21%. The Global Games Report will be launched on June 8th and includes projections toward 2018. It also describes the top trends that will drive success in the industry for years to come.